A couple of evenings back my wife was busy so I went up the river for an hour to see if I could catch a seatrout. I stuck to the 'tried and trusted' Teklon rod, Nanofil line and J9f black and silver Rapala and worked my way upstream casting up and across and spinning it back over the weeds in any likely spot. Eventually I reached a big pool where I've had good seatrout before (but not this year). On my third cast the lure was coming back across the tail of the pool when I saw a big bow wave following it. 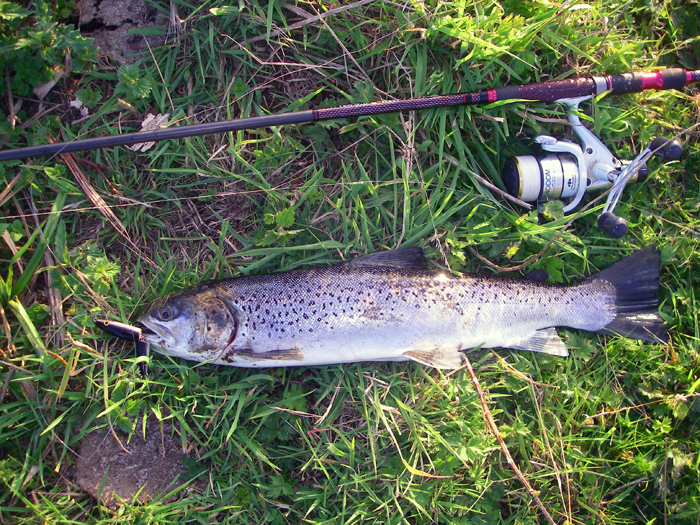 As it got nearer I could see that it was a seatrout so I just kept the lure moving and the fish took it. I expected fireworks at this point but they did not materialise. The fish thrashed on the surface a bit but it made no runs and didn't jump at all. After a couple of minutes I led it downstream until I could lay on the bank, reach down and lift it out to have its picture taken. At this point I noticed that not only was it pretty skinny (it weighed four pounds but should have been nearer six) but its vent was protruding. It was pretty silvery but had it been in the springtime I'd have said that it was a mended kelt (recovering from spawning). 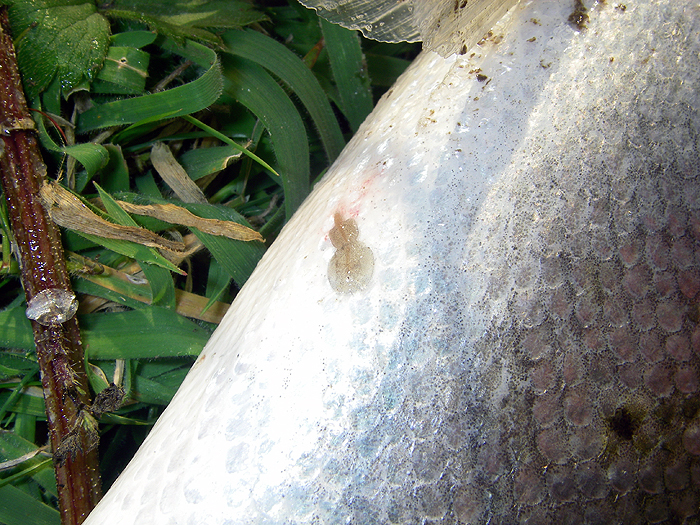 Anyway, I grabbed the camera and as I focussed I noticed that there was a sea louse on the lower flank of the fish. These parasites cannot survive in freshwater for more than a few days so the trout MUST have recently come up from the sea (six miles away). Years ago (the late 1960s) when I was working on Budle Bay near Bamburgh I used to fish two little streams, the Ross Low and the Waren Burn, which flowed into the bay. I remember that in those days I also caught a number of thin looking seatrout in the summer months. I never decided why these fish were in such poor condition at this time of the year but if anyone has an explanation I'd like to know. 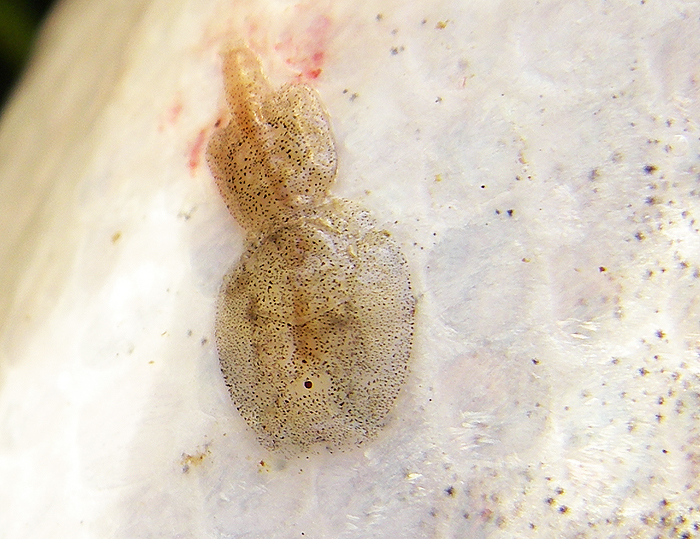 Of course I'm aware of the controversy about salmon farms and fish lice on wild seatrout but in the 1960s this wasn't such a problem and in any event the fish I caught last week only had one louse on it and didn't look as though it had been infested. Any thoughts? Oh! I almost forgot. After I'd returned the trout I fished on up with no more bites but on my return walk, as it was getting dark, I decided to have a couple more casts in the big pool. First cast I had a good take. It was hooked and it went berserk, running, jumping and thrashing about. In one of its thrashing phases it threw the hook. "Dear me!" I said. It's not much fun to lose a big fat, eight pound seatrout is it? This one wasn't thin - that's fishing!